President of the Republic of Azerbaijan Ilham Aliyev has received Minister of Foreign Affairs of the State of Palestine Riad Malki. 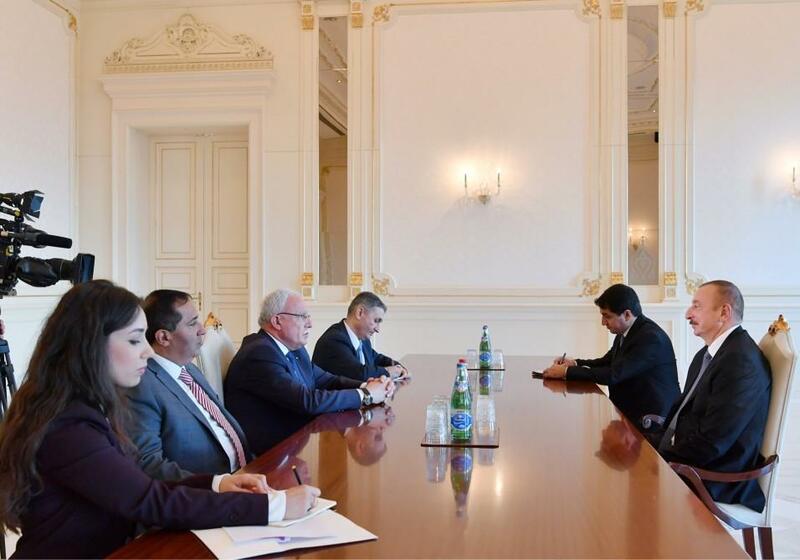 The head of state said Azerbaijan always showed solidarity and support on the Palestinian issue, describing Azerbaijan`s hosting a meeting of the ambassadors of the State of Palestine accredited to Asian countries on November 5 as an obvious example of this. President Ilham Aliyev said Azerbaijan supports two-state solution to the Palestinian issue in accordance with relevant resolutions and decisions of the United Nations, adding that this stance has been unambiguously expressed at international organizations. The head of state said Azerbaijan is making continuing contribution to the strengthening of the Islamic solidarity. Minister of Foreign Affairs of the State of Palestine Riad Malki extended President Mahmoud Abbas` greetings and best regards to the head of state. On behalf of the State of Palestine, the minister extended his deep gratitude to President Ilham Aliyev for Azerbaijan`s hosting the meeting of the ambassadors of the State of Palestine accredited to Asian countries as well as different humanitarian events relating to Palestine in previous years. Riad Malki hailed the Azerbaijani President`s participation and speech in the Organisation of Islamic Cooperation`s Extraordinary Summit of Al-Quds issue held in Istanbul on December 13, 2017. The Palestinian FM said Azerbaijan enjoys great respect and influence in the international community, expressing hope that the country will successfully chair the Non-Aligned Movement in 2019-2022. President Ilham Aliyev thanked for Mahmoud Abbas` greetings, and asked the FM to extend his greetings to the Palestinian President.